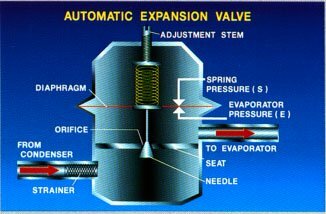 Automatic expansion valve has the diaphragm which has a seat needle and below and spring tension-adjusting screw over him. 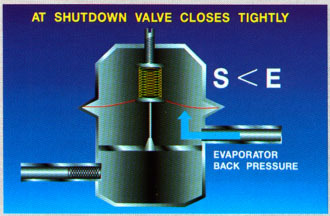 A fine-mesh strainer, as a rule, is included at the valve inlet, as shown in this diagram. This prevents any debris in the refrigerant from blocking the small passage through the opening. Automatic expansion valve is designed to maintain constant pressure in the evaporator. 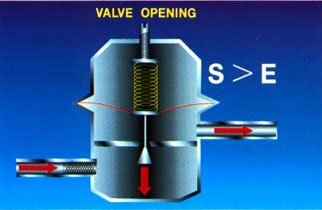 This is achieved through the interaction of forces between the pressure in the evaporator under the diaphragm and spring pressure on him. The difference between the two causes the diaphragm to bend; this, in turn, is moving the needle, or out of its seat. To see how this works, let's assume that the adjustment spring is set so that the valve keeps 69 PSIG in the evaporator (40F saturated evaporator temperature for R-22). 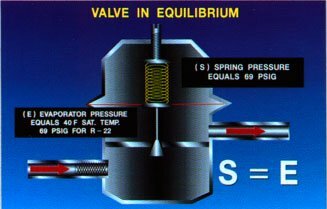 If the pressure in the evaporator 69 psig pressure below the diaphragm (pressure in the evaporator) and above the diaphragm (spring) will be in equilibrium, and the needle will remain in its present position. The speed of the refrigerant flow into the evaporator, will remain unchanged. As evaporator pressure drops below 69 psi, spring pressure exceeds the pressure in the evaporator. This pressure of the diaphragm down and opens needle valves. 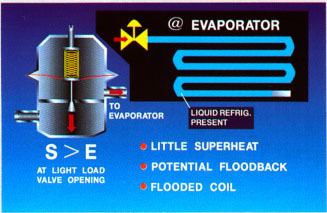 RSS in the evaporator increases, which causes more evaporator surface to be flooded. If adequate cooling load is available, more gas will evaporate, and the evaporator pressure returns 69 pounds per square inch. Again, the spring and evaporating pressure back in balance. If the evaporator pressure rises above 69 pounds per square inch, the evaporator pressure overcomes the spring pressure. This pressure diaphragm up and close needle valve. Refrigerant flow into the evaporator is reduced and the smaller its surface area is flooded. Less gas-refrigerant evaporates and the evaporator pressure returns 69 pounds per square inch. This action brings spring and evaporating pressure back into balance. 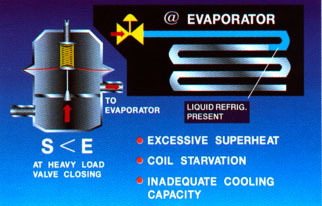 When the compressor cycles off, there will be some liquid refrigerant remaining in the evaporator, which continues to boil, thus generating steam. As the compressor cannot delete this pair when it is off, the blood pressure rises higher the pressure in the evaporator coil and forces the valve is closed. Valve remains closed and all the outside of the loop. When the compressor cycles ago, the evaporator pressure drops quickly, allowing the needle valve to open and liquid refrigerant flow into the evaporator, to meet the needs in the cold. The lack of automatic expansion valve is that it is designed to respond to the evaporator pressure instead of a cooling load or superheat of refrigerant vapour at the outlet of the evaporator. The result is that the state of the refrigerant from the evaporator can be inadmissible under certain loads. For example, if the cooling load is reduced, less liquid refrigerant will boil in pairs within the evaporator. This causes the pressure in the evaporator to the fall which opens a needle valve. And more flowing, the refrigerant in the evaporator, more flooding its surface occurs. 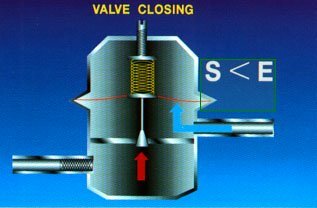 If the load is adequate enough liquid evaporates to increase the pressure in the evaporator again, balancing its pressure valve spring. If not liquid refrigerant will flow at the outlet of the evaporator. This fluid overflow is a serious threat to the compressor. If, on the other hand, the load increases, more liquid refrigerant will go in pairs, increasing the pressure in the evaporator. Thiswill move the needle valve in the direction of " closed " and send less refrigerant in the evaporator. Less refrigerant means less boil and lower the pressure in the evaporator. As it happens, the valve will return to equilibrium. Less flooded evaporator, the refrigerant inside becomes more overheated. Evaporator cooling capacity is likely to become inadequate for the work and the refrigerant from the evaporator may become overly overheated. This can lead to overheating of the compressor, which can lead to high compressor discharge temperatures and pressures, oil breakdown, carbonization valves, and low efficiency.